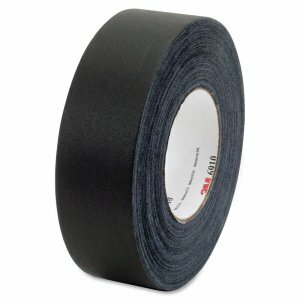 Cloth Gaffers Tape 6910 is vinyl-coated cloth tape with a rubber adhesive for use in the entertainment industry as gaffers tape where light reflection is a concern. Matte finish, coated cloth tape offers good adhesion, high tensile strength, conformability, adhesive transfer-resistance and easy tear. Low light reflectance backing is perfect for entertainment and video productions. Typical physical and performance characteristics include a 12.0 mil thickness, adhesion to steel (45 oz./inch width), tensile strength (45 lb./inch width), 5 percent elongation at break and temperature use range up to 200 degrees F (93 degrees C) for up to one hour.